Re: Show me your rings? My ring is an opal surrounded by diamonds. I have no idea the specs - it's a ring my FI's dad made for FI's mom. I adore it. Woot woot for another opal! I love all the different stones and settings! Some are so unique! 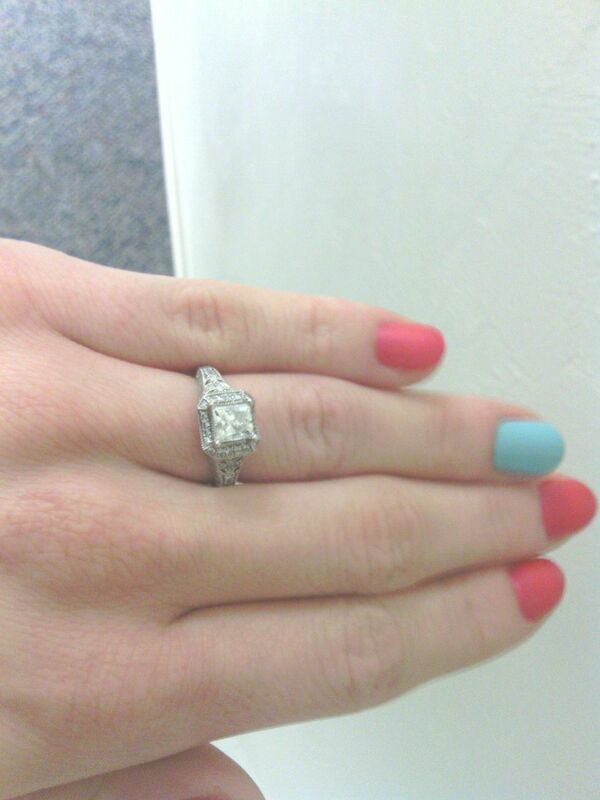 My ring is princess cut with pave setting, diamonds on the band. Still picking out my wedding band, can't decide if I want to match or not! I cant wait until April so I can wear both. 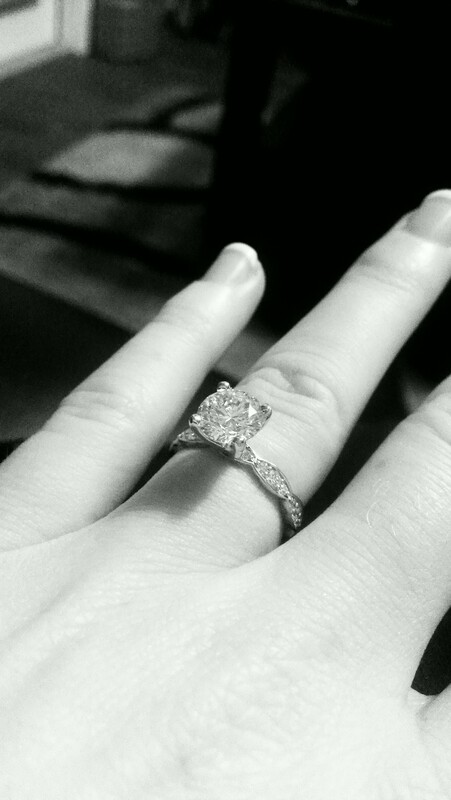 I actually don't like knowing the specs on my ring, but if have all the paperwork from when I got it insured... I have never been asked nor do I share the information. So tacky. 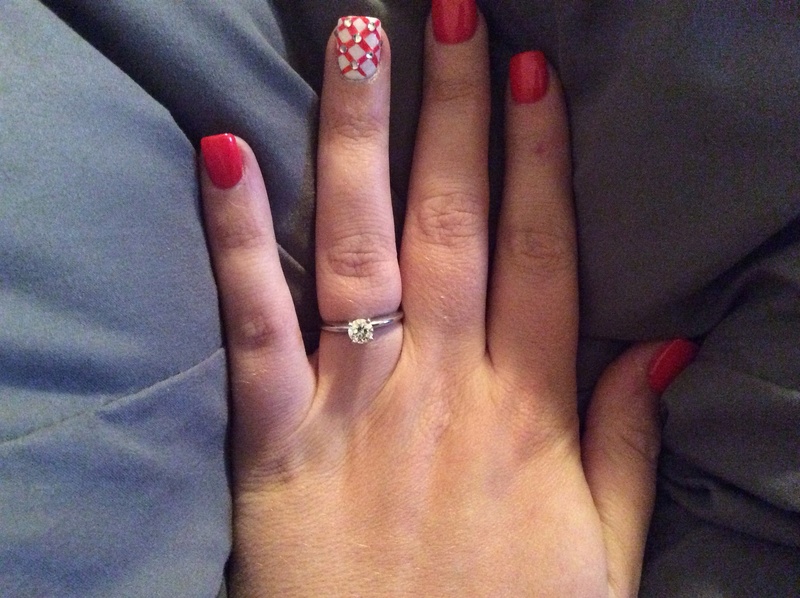 Mine is a round brilliant cut solitaire. I think that's what it's called. Ha. 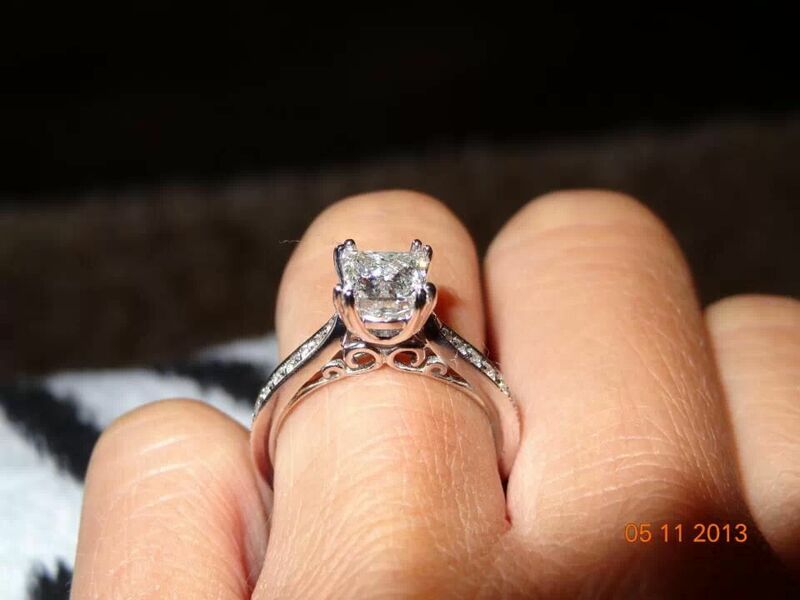 To me it's just beautiful and timeless in its simplicity it's on a platinum band, four prongs that FI apparently made sure were like extra heavy duty strength (I'm a teacher and I ride horses so he figured I would be a little rough on it.) On a related note... Weddings bands. I'm weird about things being symmetrical and even, is it strange to get a band for both sides? More common just to get one and maybe a second for anniversary? Hmm..
Everyone is sporting some fabulous jewelry! I love my cushion cut and the unique cutout band. FI did a darn good job! I don't have a good picture or a way to take one right now. 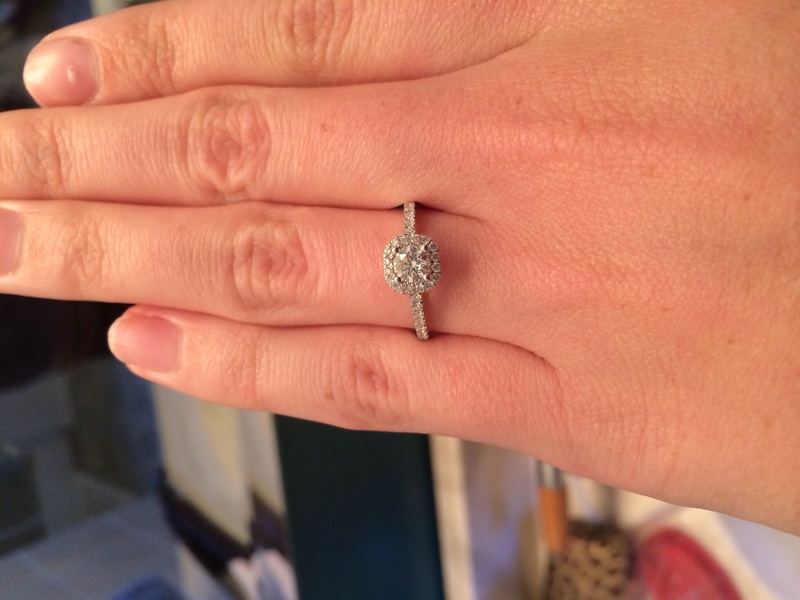 My engagement right is a gold band with nine round diamonds flush set (upon googling, I realize it's actually called channel set) into the band. I wear a hammered gold wedding band along with it. 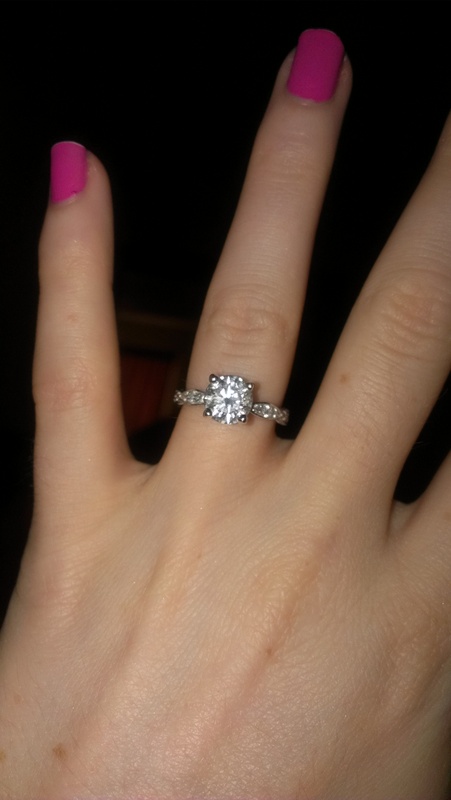 My engagement ring is very non-traditional, more like a wedding band actually, but I love that, and when he asked what I wanted, I specifically told him something that didn't stick up or get in the way. 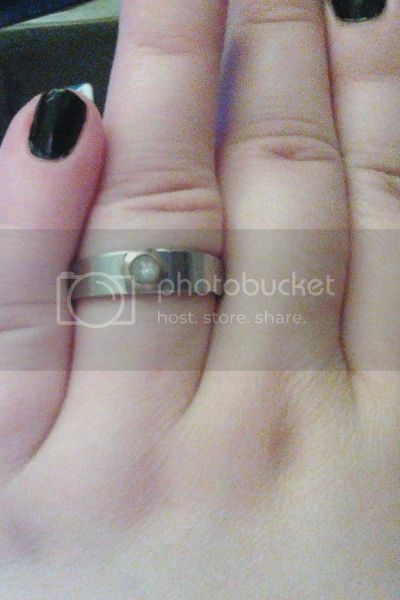 It looks very similar to this except this ring looks really really chunky. H told me what kind of diamonds there were and what the weight was and everything, but I honestly don't remember. @tcnoble I have one or two friends with double bands and it looks pretty-- LOTS of bling. It did seems a little confusing the first time I saw it though, I was wondering if there was a purpose behind the two rings and which one (or both?) they used during the ceremony. But I see it a lot on the subway and I think it's pretty common. Wedding band fits in between the two bands. 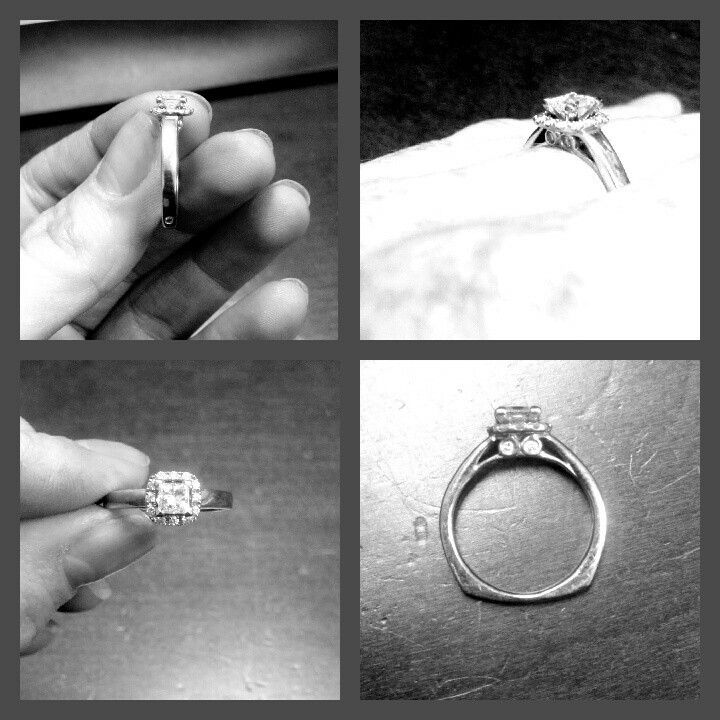 I'm trying to get my ring to post my ring is 14ct white gold the center diamond is .97 carats color E and VVS2. 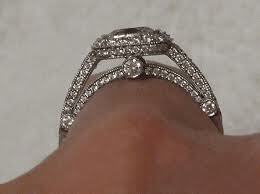 It has two smaller diamonds on the side and the band has pave diamonds in the band. I love it so much. I know how much the ring appraised for since I was on the phone when we had it insured through our home insurance. 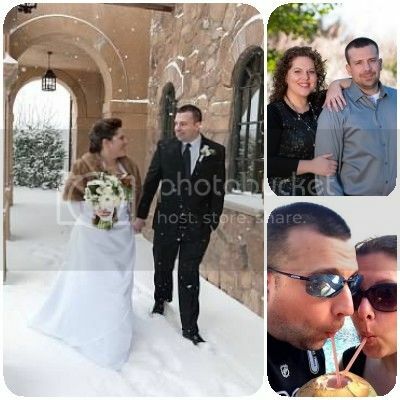 I'm trying to post a pic I will add one on tomorrow. It's actually a mens ring, but it was the only "stock" ring that fit me. It's stainless steel, and it used to have a diamante type thing, but that fell out. We replaced it once, but it just fell out again, so now it has a nail jewel set in clear nail polish instead - mostly just to stop stuff from getting caught on/stuck in the setting. It was only $2, so I'm not too worried. We have ordered a custom ring for me, but with FI's car most likely needing a completely new engine, we've put that order on hold for now. I don't even really feel like I need a ring, but FI wants me to have one so everyone knows I'm taken. 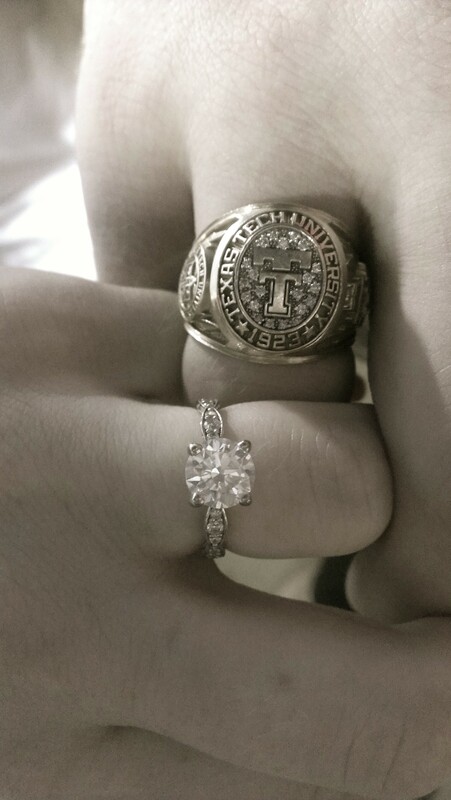 My ring picture is in my siggy. The diamond is from his great-grandmother's engagement ring and there are blue sapphires on the band. The wedding band is also blue sapphires. This is mine! Princes cut with a halo. It is also squared on the bottom to be flush with my finger. I work in parks and rec so it had to be sturdy. My FI had it custom made and I would never ask the specs about it and i don't care. All I know is how much I love it! 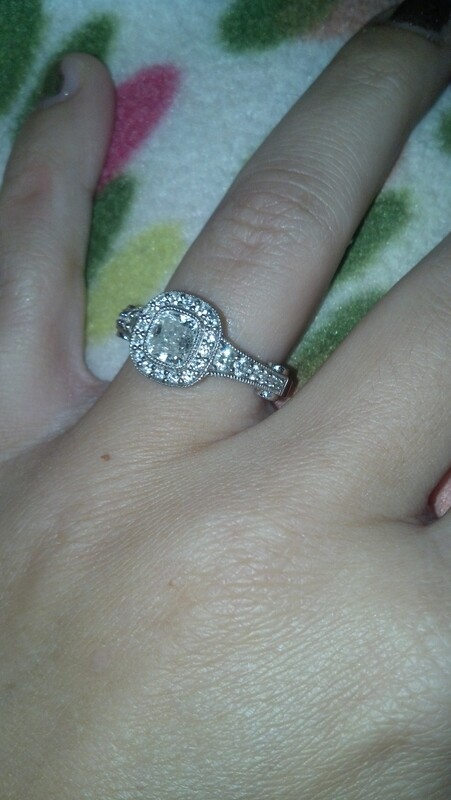 Love my E-ring and it comes in set with the wedding band! @JaniV123 love the Medalla bottle in the pic! I LOVE how different everyone's rings are! 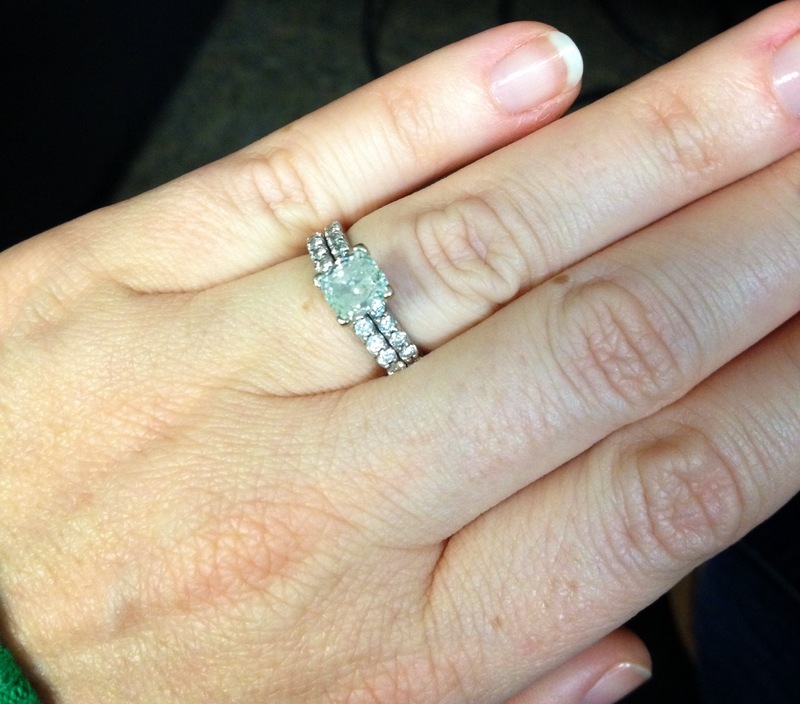 The story about my ring(s) makes me feel like a total spoiled brat! 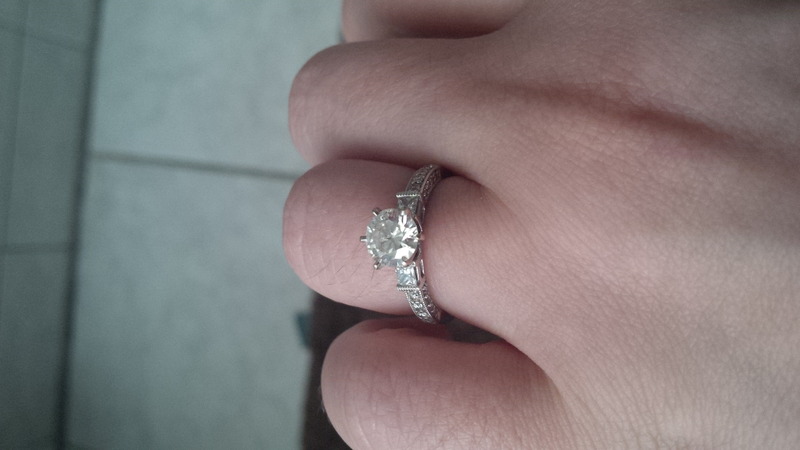 Because I technically have 2 engagement rings. My FI knew that I always wanted something unique in one way or another (different colored stone or different colored metal). I always knew there was a diamond that my grandmother was leaving for me (actually she wore it for a long time, then it was given to my mom who wore it for a long time, and when my dad gave her a new ring for their 20th, it was put away in a safe for me). I knew I would want it reset as the setting sat up very high and I was scared it would always catch on things. Well around the time that my DH was planning out the proposal, he grandmother's health was rapidly declining and at that point, we knew she wasn't going to be with us much longer. DH didn't want to bring up the diamond and my mom honestly just didn't even think about it. 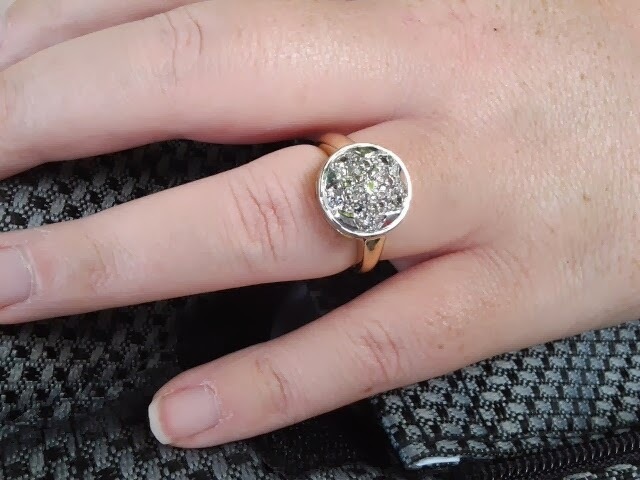 DH picked out another ring for me with the money he had been saving for years (we are young, we are doing just fine, but don't exactly have a tone of disposable income). 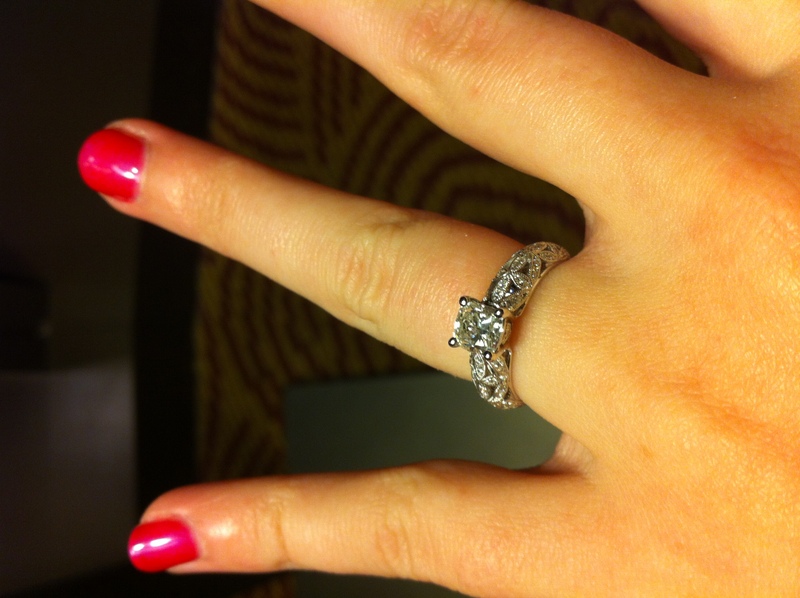 He picked a beautiful ring with a champagne diamond center stone and proposed in November 2012. My mom was going through things after my grandmother had passed away and brought up my grandmother's diamond. 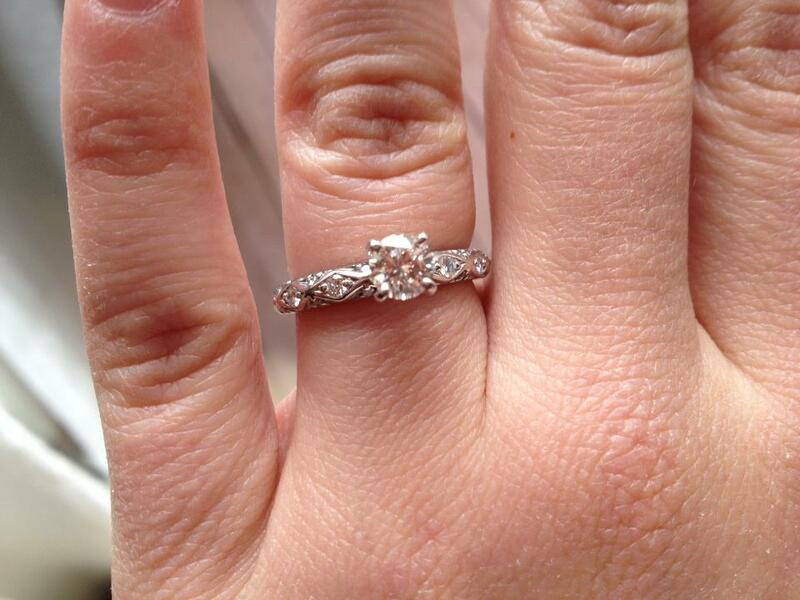 She was by no means suggesting we replace my ring, but she wanted me to have the diamond to do what I wanted with it. 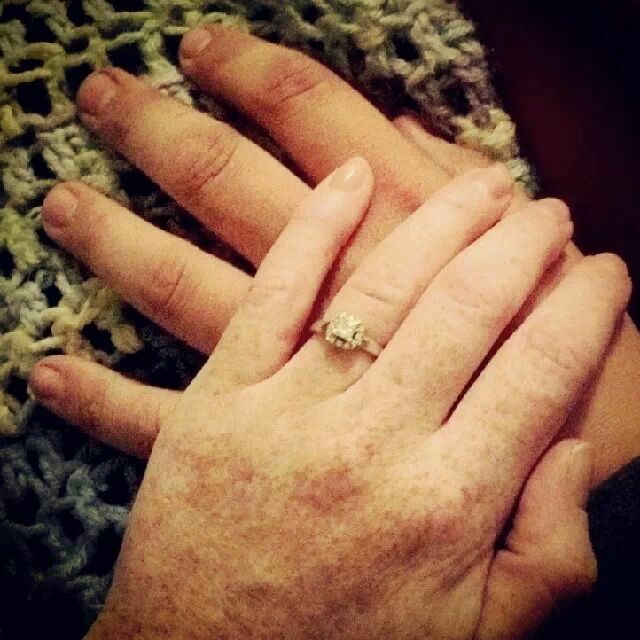 My mom, DH (FI at the time), and I decided to have it reset in a right hand ring. I set it in rose gold (my grandmother and I loved rose gold!) 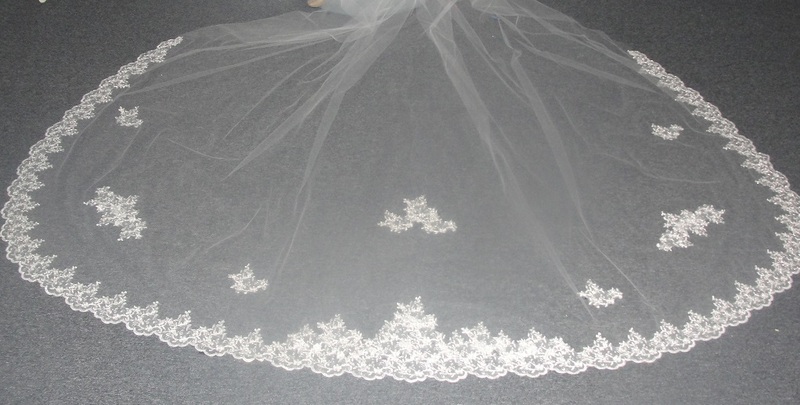 and it turned out beautiful and was so special to have a piece of her back because I know she would have loved to be a part of the wedding. Well the day we picked it up, FI surprised me. When we got home, and it was just the 2 of us, he told me he knew how much that diamond meant to not only me, but to my mom and grandfather. 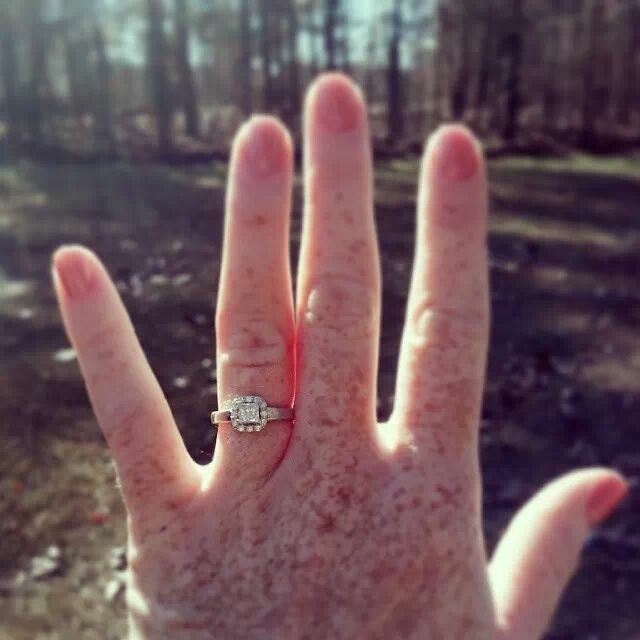 He re-proposed with my grandmother's ring and told me he wanted me to wear it on my left hand. My family and I were beyond touched and it now sits on my left hand while my other gorgeous ring sits firmly on my right hand. So that's my long winded story! I have no idea about weights or anything...all I know is what I needed to the insurance policy. I've never felt a need to share that. 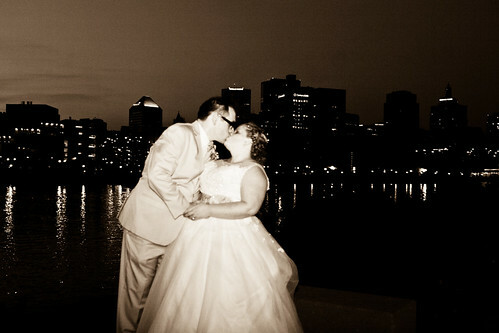 @bmorebride6 your rose gold ring may be my favorite of all of them. It is beautiful! aw @AprilH81 thank you! I would have never chosen a pear shape for myself but now I'm so happy it is that shape! It turned out perfect and it has so much meaning to my family. Here are mine. They are rose gold, which I adore. I also love that on the e-ring, the main diamond is lifted so that the small diamonds make an uninterrupted line underneath it. It's really hard to portray in pictures. I have no idea the specs on it, but I adore it because I have never seen something quite like it. 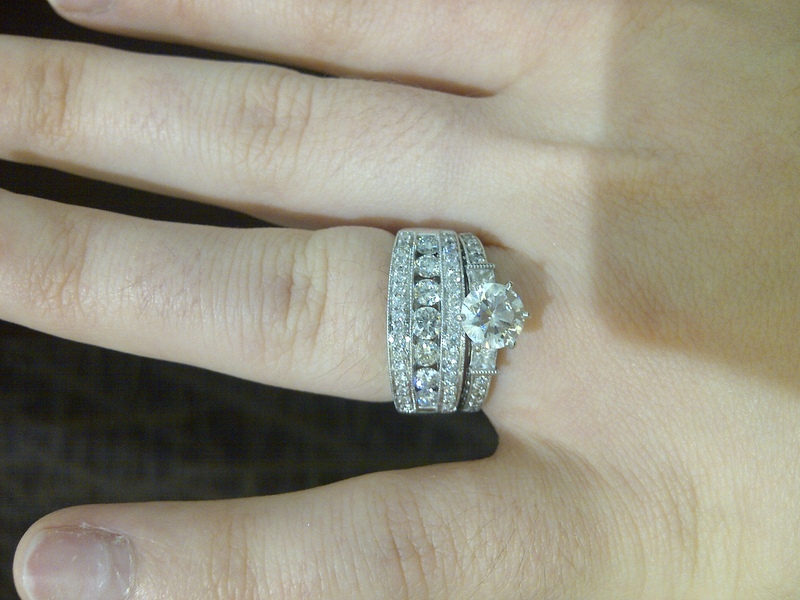 Also, the designer let us customize it a lot - it originally came in white gold with a round diamond. He cast it in rose gold with a square diamond for no extra charge. I love rose gold, too! I chose a rose gold half-eternity ring for my wedding band to complement the inner rose gold halo I have in my engagement ring. Rose gold is so pretty! 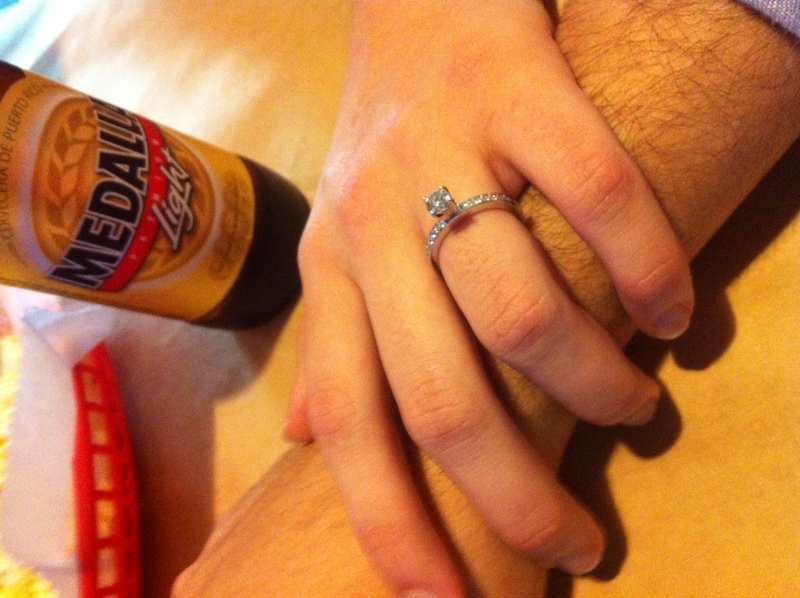 Here is my ring. H did a fabulous job! 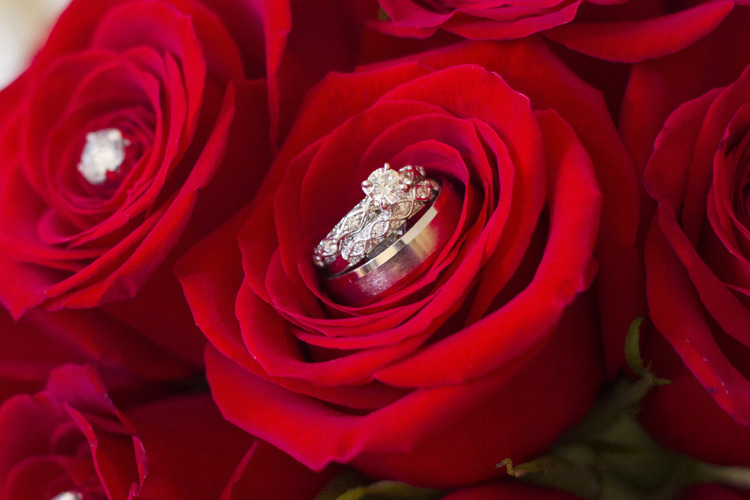 Your rings are gorgeous. I love rose gold and square stones! My DH gave me an infinity necklace a year into our relationship and wanted the design for my E-ring. 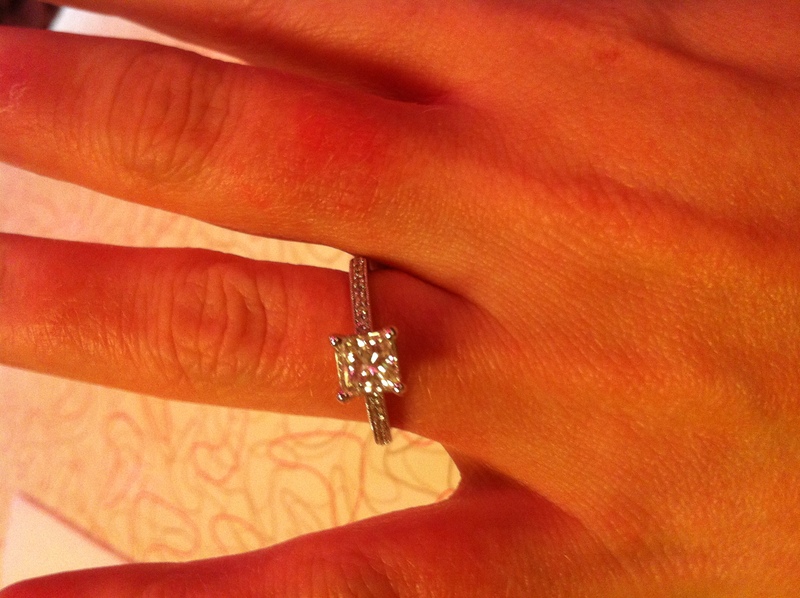 He went to a local jeweler and picked out the design, but it had to be custom ordered. The diamond he selected from the jeweler here in MD (where I'm from) and the band was custom made in NY (where DH is from.) I love that I carry a little piece of both of us. I'm trying again, now that I'm at a regular computer. 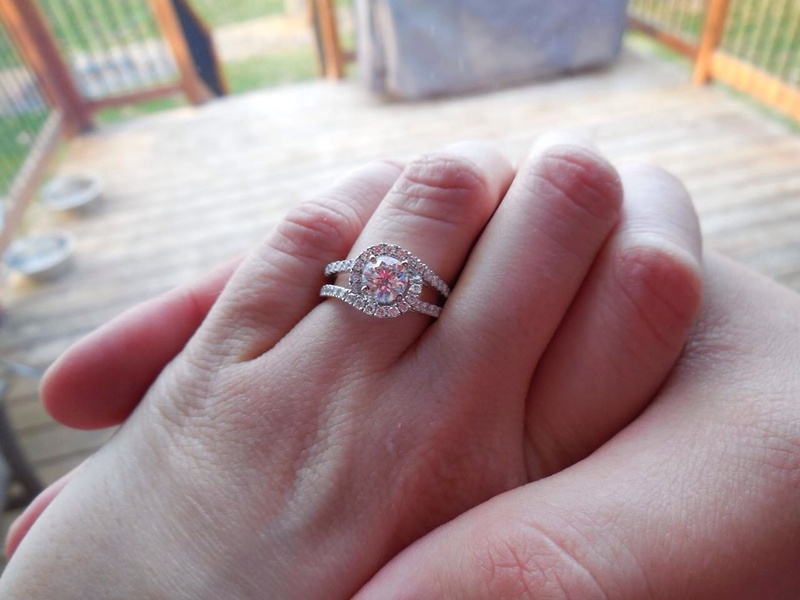 FI and I designed my ring, with diamonds given to us from his mother, who had gotten them from his grandfathers longtime girlfriend and were in super fancy earrings. I won't be doing a wedding band.